Earn up to 1,192 reward points. Get awesome, versatile fuzz tone with active EQ and a boost. 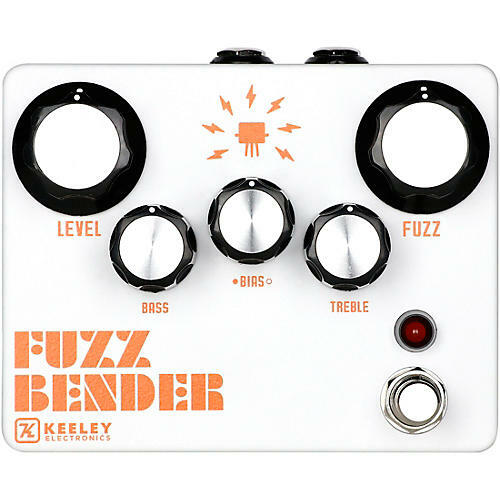 The Keeley Fuzz Bender is a 5-knob, 3-transistor modern fuzz that uses a combination of high-gain silicon and silky smooth germanium. What makes fuzz better? Active EQ. Using two gyrators as an active EQ gives you the ability to create massive fuzz tones not possible with typical square-wave boxes. Pummel your amp with over 20dB of boost/cut at 100Hz and 10K Hz. The Fuzz Bender is built around vintage Japanese germanium to create its monumental fuzz tones. With the all new Bias Control, you control the attack and decay of your notes. Anything from Fat Square Waves to Angular Fuzz to glitchy-Velcro attacks are possible with the Bias Control. The Fuzz Bender's five knobs confirm size matters when creating a new and epic world of fuzz.